it is still consider a method that each one of us has. If we were to compare industry at the same level, it would be an easy job for all of us to notify, what happen to the industry in general. 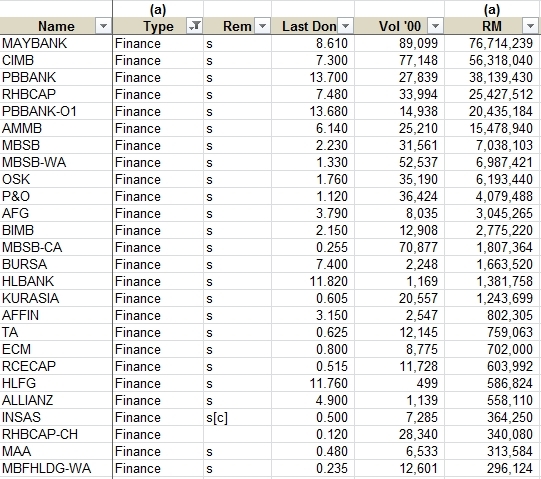 If we were given a choice to choose finance industry, would it be Hong Leong Bank Bhd? would it be Public Bank Bhd? would it be Maybank Bhd? Which of these 3 has made the impact of the industry? Which leads in terms of volume? Of course, when we are preparing the list of corporates under financial industry, we would notice among the rest, which stays at the bottom afterall? Knowing the industry volume, it would at the next stage of identify volume due to Big Steady Players, or due to Goreng factors. What would we choose is the volume of value instead of quantity of shares. It is much easier to say which corporates has RM3B shares trade daily compares with RM1B shares trade daily. Without volume is basically without movement, as people more to holding the shares instead of trading it for profits. Actually, every shares has their own low value or attractive value. Since we are at the same level of industry, it is much easy to identify, let's say Finance Industry, Maybank is heading downwards, so with other finance companies. 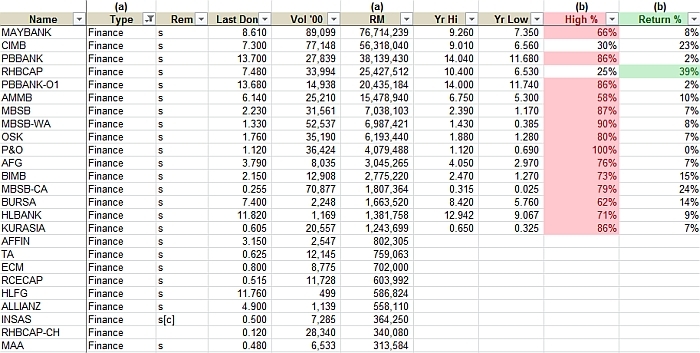 So which one would we choose, and which one would have the most potential and attractive value based on Volume. The low is compared towards yearly low. It is much easier for a value from 0.28 to jump towards 0.47 or more, if compares to 28.00 towards 47.00, therefore it would be seldom finding a share more than RM20.00 in nature, as it would not be attractive enough. Of course, to target our profit at a level of yearly high is very tough and need some time. * Sometime if we wish to accept the loss, we may simply sell it at loss. we are enter it as a 2nd opportunity. Each of us has different skills and methods, and by asking what is our plan in the first place? Well, the most challenging method is when Economy crisis is happening, how low is low that we decide to use our bullets, to invest as many as possible at the same time not making ourself suffocate. So the questions of Hold, Sell, Reenter, has tight relationship with the Good Accounts with Good Directors inside the corporate itself. Monitoring directors shares from the corporates is something known as the interest of directors towards corporates. which is more important to able in sustaining during the Crisis once it happens. ONE MIGHT SAY, THEY MANIPULATE THE ACCOUNTS, well, it really depends on what are the figures to manipulate? In term of Crisis, it's always numbers from the BANK or BORROWING figure in the accounts that control everything, which is "Cash Flow" for sustainability. Other than that, you would probably ask, why they increase borrowing if the business is making profit? Of course, if you are investing a share without knowing the Chart, that show how high or how low the price now, then the definition of investment or business is the problem, Buy Low Sell High, Cost is lower than Selling Price doesn't exist at all. Just don't get to deep into their accounts for investment, as what we would get in return annually? Dividend? Selling Shares? or Selling their business if they make profit so that everyone gets profit? Once we have known something about the accounts especially "SURVIVAL", we would know about the allowance period to hold or to sell or to reenter, so that they won't be extreme selling off happen. 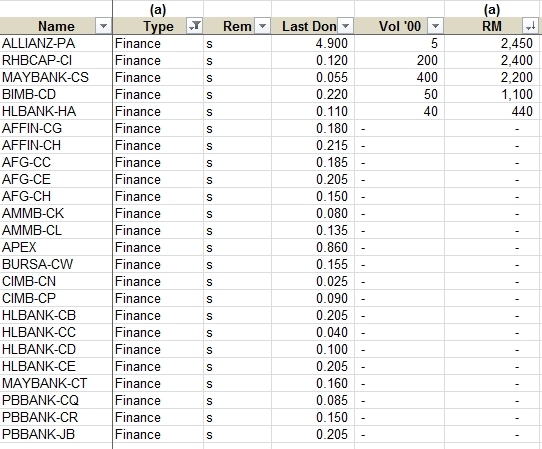 From the list above, CIMB and RHBCAP would be a study case in the financial reports due to the return value is attractive enough accompanied by the volume. Of course, given the option of every shares above is at the lowest price during economy crisis, we may able to select which one works the best once we have done analysis from time to time. Hi Steven, so glad I notice u make a come back to your blog. The last visited was last year February and notice u stop from updating your blog until today only realise u has been update half a year ago..
First of all, thanks for visiting again. It took me quite some time to update the financial reports, and feel lazy of doing that. However, thought of mastering the skill in shares, as well as mastering some technical skill in blogging, it does give me some satisfaction what have I achieve now which is able to learn something new as age seems to be increasing. We are no longer younger....hahahaha. You are right. But your content getting mature and mature. Currently I am holding MSC which I think is undervalue and it should give me a good return in middle term. Since you have set your plan and goal initially, and I guess you have read my analysis, do feel comfortable to start explore other shares as well. You have been in shares market for many years? Actively since 2009, able to make 25% return within a year mostly due to bullish market but back to breakeven and sometimes negatives during 2011. Now buy heavily on MSC. If everyone try to improve themselves, I guess sooner or later we would get back what we want. Wish you all the best.